During a dinner date with Dan Hardesty at the Park in SLO, we found it difficult to decide on one wine from the long list of excellent Central Coast and international wines. So when owner/chef Maegen Loring, whose taste in food and wine is extraordinary, recommended the McPrice Myers 2005 Grenache we didn’t hesitate to order it. Still, I never expected that it would be a revelation, and we drink great Central Coast wines regularly. TWO OF A KIND: And what a pair: Russell From (left) and McPrice Meyers are responsible for some of the best Central Coast wines. No more. These days, instead of heartless barbs he’s busy extolling the qualities of Central Coast artisans. In fact Laube, too, raved about the McPrice Myers 2005 Grenache, giving the $32 value-priced wine an awesome score of 93-points. The delightful wine is the namesake of owner/vintner McPrice “Mac” Myers, of whom I knew little, though I had highly recommended another of his wines: Barrel 27 Syrah 2005 Central Coast (Dec. 27, 2007). I picked up that impressive red for only $15 but it had the depth of other brands priced twice as much. This brand however, is owned by Myers and his partner, winemaker Russell From, whom I had met at Hospice du Rhone but had never interviewed. That telling note spoke to me of the passion in From and Myers. While many big wineries (corporate types that can buy the big ads) tell wine lovers how passionate they are about wine, these two guys exude ardor. As we tasted through their long lineup of impressive wines from all three labels, they would occasionally speak to each other as I imagined they do while tending to their wines still sleeping in barrels—I felt privileged to a private conversation I wouldn’t normally hear. And witnessing their fire for their craft impressed me as much as the quality of their wines. 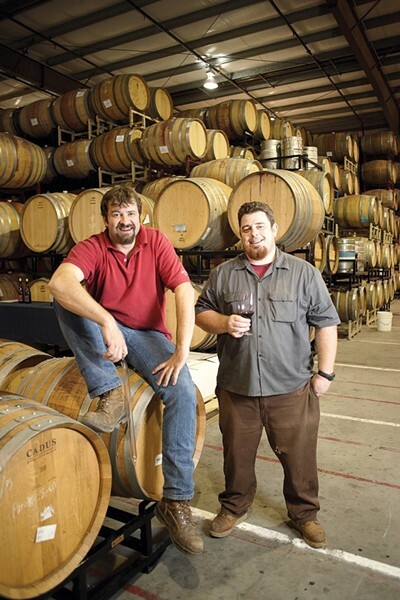 In the early 1980s, such passionate young winemakers as Jim Clendenen of Au Bon Climat and Bob Lindquist of Qup» in Santa Maria Valley could start up a brand on an apprentice’s budget and become the winemaker superstars they are today. From, a 2000 Cal Poly graduate in agriculture business, began working at CCWS as night-shift cellar master. He began making Herman Story wines, named for his deceased grandfather, in 2001. Myers was working for Trader Joe’s (since he was 18) where he developed a passion for wine and food. As he began exploring wine regions he discovered Paso Robles, he recalled: “I fell in love with the area as much as I did the wines.” He began working with area winemakers for the experience and, when he was ready to break out on his own, his peers suggested leasing space at CCWS, a haven for small producers. When Myers began moving his barrels in, he met From. “I invited Mac to check out my wine’s coming from different regions, but at different stages,” said From. After sharing some wines, vineyard discussions, and punching down fermenting grapes together, they had established the beginning of a beautiful friendship. INFO BOX: McPrice Myers, Herman Story and Barrel 27 wines can be found at Monterey St. Wine Co., 15 Degrees C, Los Olivos Grocery, or online at www.barrel27.com.